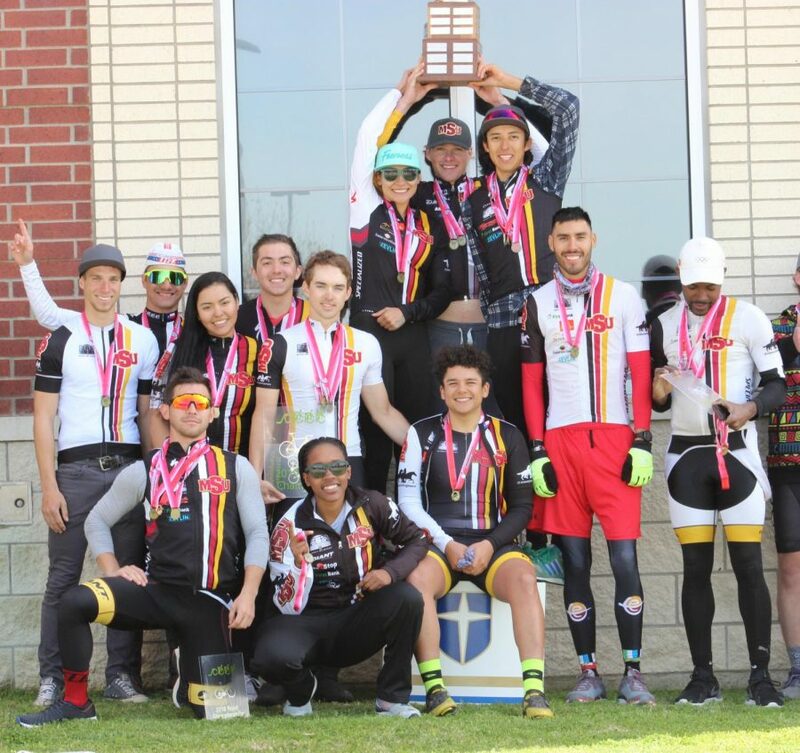 Cycling team celebrates 13th consecutive title at South Central Collegiate Cycling Championships. Photo by Charlie Zamastil. March 31. 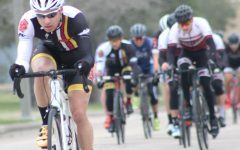 The cycling team’s status as mammoths of the sport in the region was confirmed once again on March 1 when the team powered its way to their 13 South Central Collegiate Conference Championship (SCCCC) title at the Mean Green Classic race weekend hosted by University of North Texas in Denton, Texas. 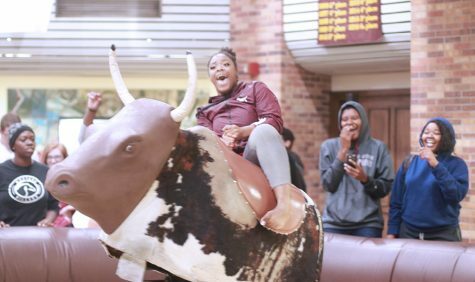 Owing to strong performances in all seven categories across the men’s and women’s division, the team amassed a weekend-best 516 points over the two-day Conference Championship, bringing their total to 1,405 points – over 200 more than their nearest rivals Oklahoma State University and hosts UNT. 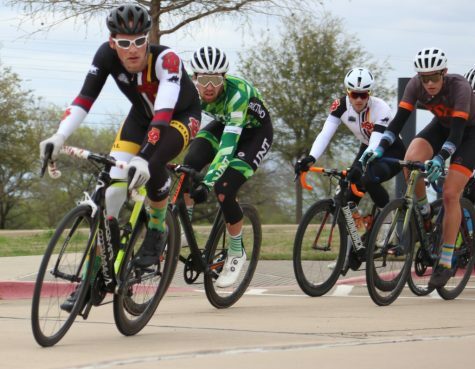 Zach Gregg (left), exercise physiology graduate and Pablo Cruz (second-left), exercise physiology senior leads group during men’s ‘A’ criterium at South Central Collegiate Cycling Championships. Photo by Sharome Burton. March 30. 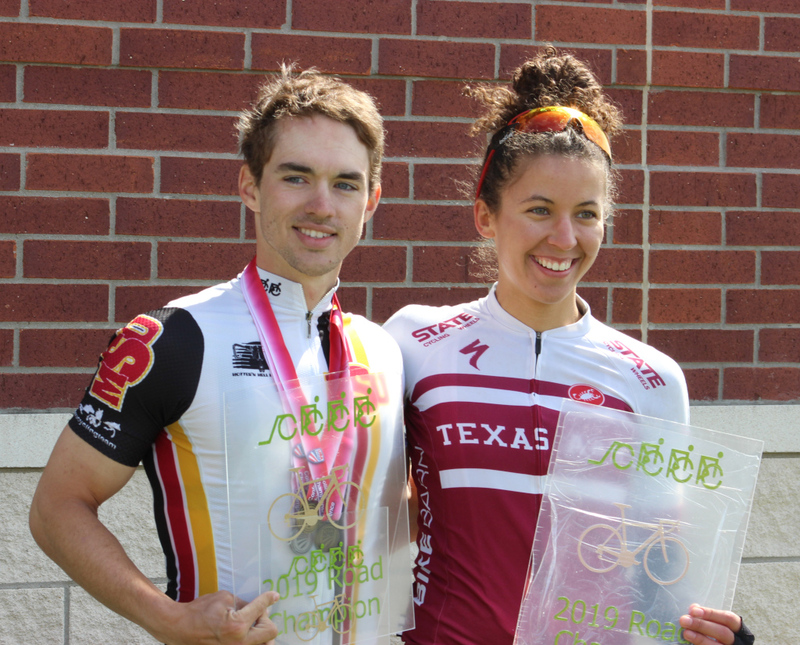 Charlie Zamastil, cycling director said the team delivered the collective effort that was needed in the final weekend. 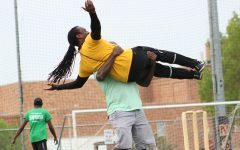 Zamastil said the team’s latest triumph reflected an ability to overcome difficulties that were present throughout the season. 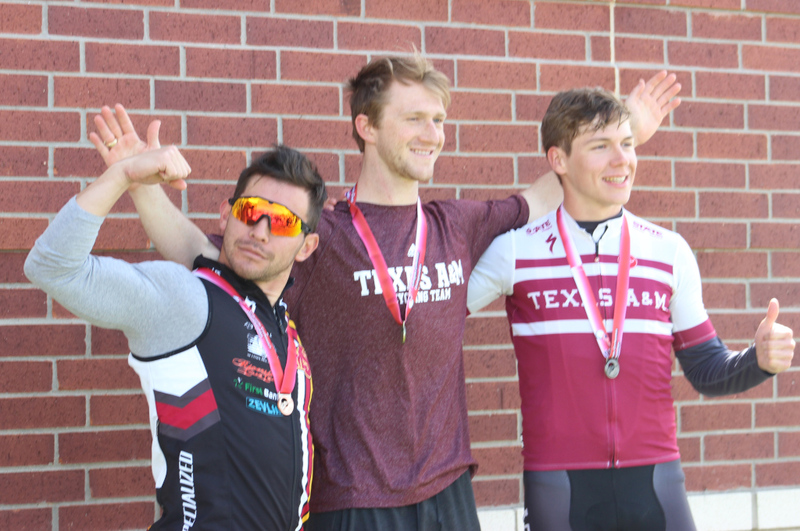 Zach Gregg, exercise physiology graduate receives applause after being crowed overall champion at South Central Collegiate Cycling Championships. Photo by Sharome Burton. March 31. 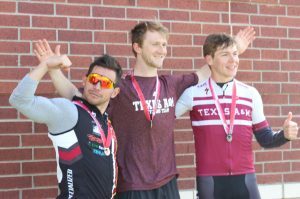 While a 13 straight conference title screamed of team dominance, the individual success of Zach Gregg, exercise physiology graduate also shone through March 31 when he literally rode away as the men’s ‘A’ overall champion with an unassailable 1,385 points after winning the final road race. 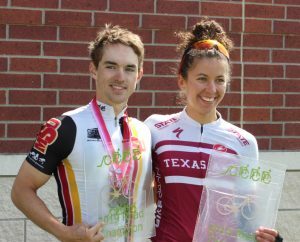 He placed second in the criterium and first in the individual time trial – ensuring that he won every single event for that discipline for the season. Gregg said the level team support was a catalyst to his success in his first season at this university. However, the ability to thrive in a team environment didn’t come naturally, according to Gregg. 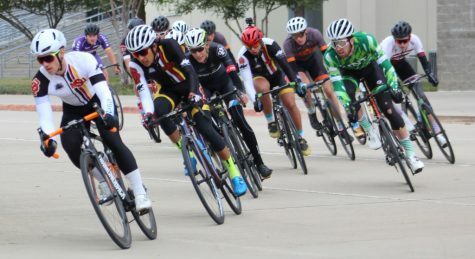 Joshua Buchel, accounting and finance senior holds lead while cornering during men’s ‘A’ criterium at South Central Collegiate Cycling Championships. Photo by Sharome Burton. March 30. 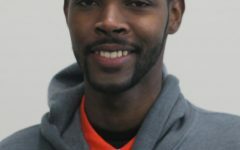 He said his personal growth and that of the team was pleasing heading into the next major assignment – the United States Collegiate National Championships from May 10-12 in Augusta, Georgia. “Being able to use this race season to make mistakes and build the chemistry in that long road up to the national championships was super important to me. I could not be happier with how the season has gone up to this point. I’m really excited to get into some bigger races in the warm weather at Nationals,” Gregg said. Zamastil said the best is yet to come for the team. “They’re in good form now but really their season culminates in five weeks’ time. 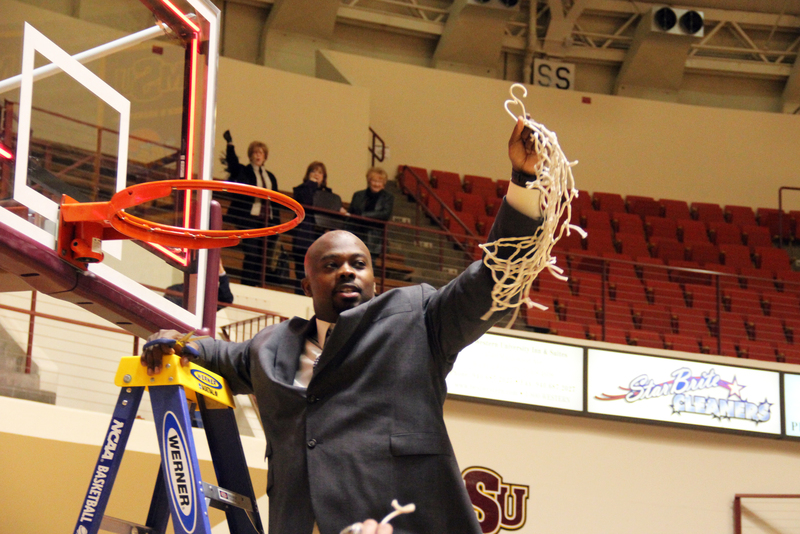 They being able to do so well still only at that 90-95 percent of where they need to be bodes really well going into the National Championships,” Zamastil said. 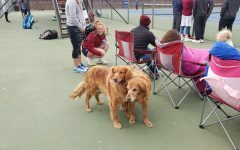 He was confident the team will make adapt to the conditions at Nationals. “We’re probably gonna face the opposite extreme at Nationals next month. 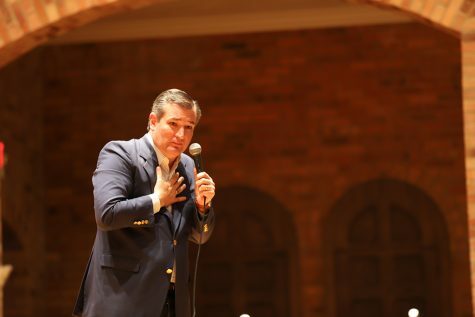 In early May in Augusta, it’s going to be hot and humid but we’ve proven that there’s no weather condition that’s too extreme or too challenging for us to face throughout the entire year,” Zamastil said. While the feats of the ‘A’ men’s team drew much of the attention throughout the season, Zamastil highlighted the progress made by the lower-category riders, who he said grew after each race. 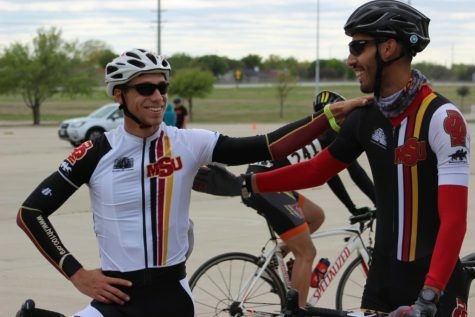 Ramon Rueda (right), exercise physiology graduate speaks to Jari Vaes after men’s ‘C’ criterium at South Central Collegiate Cycling Championships. Photo by Sharome Burton. March 30. Ben van Winkle (left) celebrates podium finish in men’s ‘B’ category at South Central Collegiate Cycling Championships. Photo by Sharome Burton. March 31. Van Winkle, himself a past coach said the team development was one of the prouder things he took from the season. 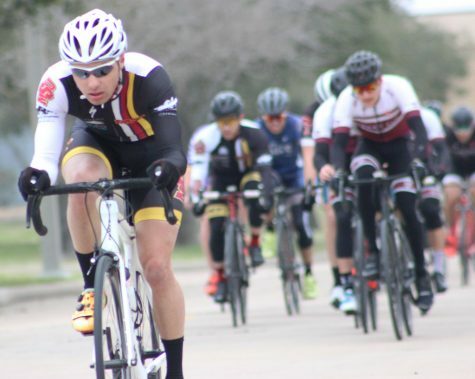 He said nurturing the passion of some of his rookie teammates was one of his goals heading to the 2020 collegiate road racing season. “Along with the experience, I think one of the best things I can do heading into next year is cultivate the development of the newer riders. 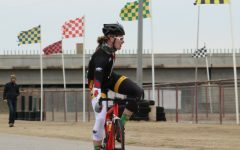 Being newer to the sport has its advantages and part of that is being passionate and fresh and I think as someone who has been involved in sport for a long time, that the hardest thing is finding that passion,” van Winkle said. Cycling director Charlie Zamastil said every person should have a share in developing the cycling programme, which he believes is one of the beacons in the community. “Jump on board. 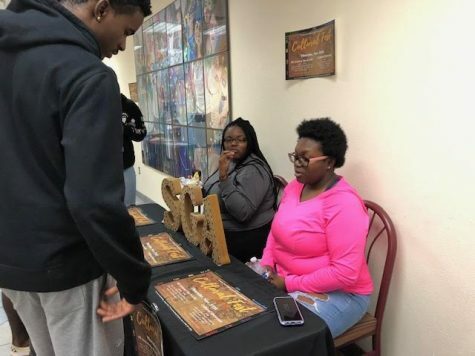 [The cycling program] is one of the best things we have going on in this town and our school, so everyone lend their support in every way that they can. 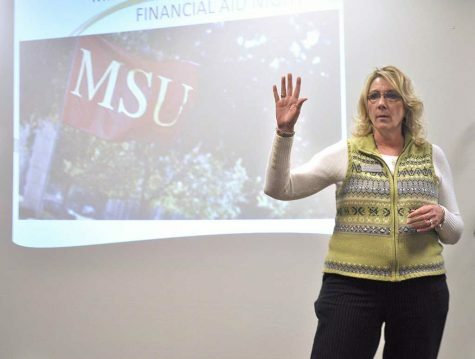 We’re gonna bring Wichita Falls and MSU home something to be proud of,” Zamastil said. 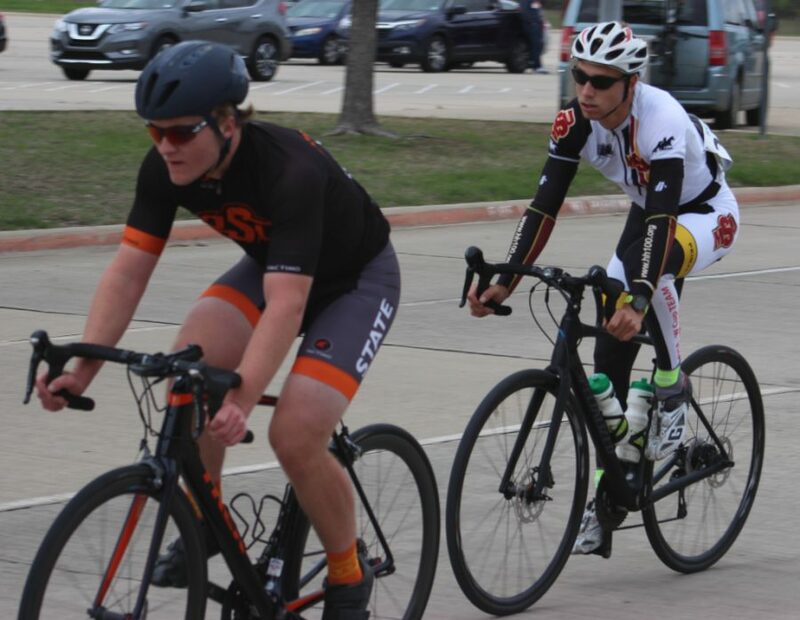 Jari Vaes, men's 'C' rider drafts behind rival during men's 'C' criterium at South Central Collegiate Cycling Championships. Photo by Sharome Burton. March 30. Great sports article. 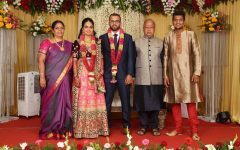 I could feel the excitement Congratulations to all of you.